The City of Foley, Alabama was founded in 1905 by Chicago pharmacist, John Foley, planned from the get-go. The rich farmland drew and pleasant weather drew midwesterners to the area. The Bay Minette-Fort Morgan Railway was added in 1905 to make travel to Foley easier. Of course, Mr. Foley was the financial backer for that project, too, because planned towns often have a visionary benefactor like that. The train station burned to the ground just three years after it was built — though it was soon replaced by the station that you see today. 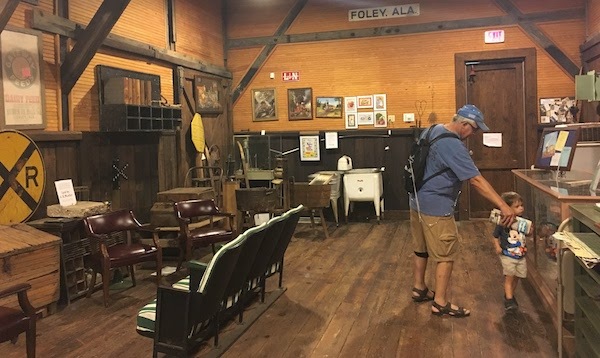 As is the case with many small towns, the train stopped coming, replaced by roads and cars — though Foley held on to its rich train history, preserved at the historic Foley train museum. A happy ending we can enjoy today. The museum is located at 125 E Laurel Ave, Foley, AL 36535. 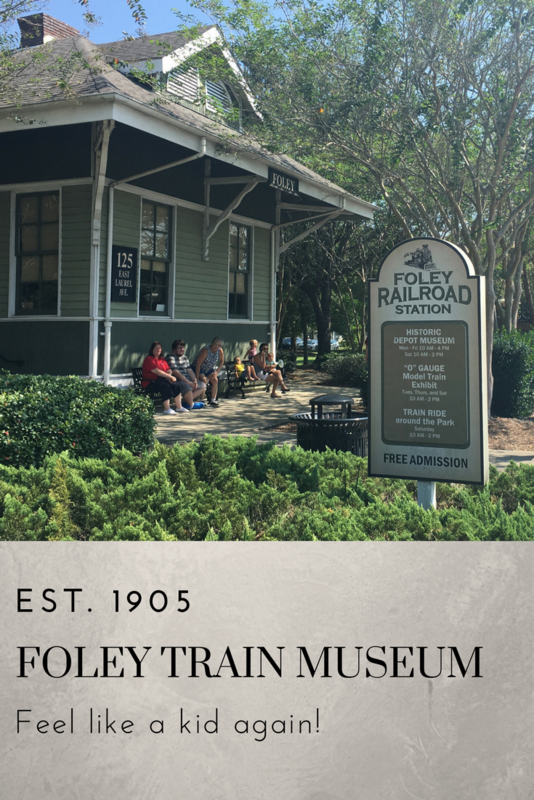 In the Foley train museum, officially called the Foley Railroad Station Historic Depot Museum — we’ll stick with train museum here — Foley’s history is preserved. Along the walls in the depot you’ll find information about the train depot and the town’s railroad history (of course), photos of city leaders and many tributes to local sports team. After all, Foley is in the heart of SEC country, and high school football is big around here! It doesn’t hurt that Oakland Raiders great and football legend, Kenny Stabler, grew up in Foley. NFL Hall of Famers tend to bring some pride to their hometown! Stabler memorabilia, as well as memorabilia from the movie Hometown Legend (2002), is also displayed in the museum. Of course, fans of the railroad will find lots to enjoy. It is a train museum, after all. Museum Hours: Monday-Friday, 10 a.m. – 4 p.m. and Saturday, 10 a.m. – 2 p.m. Admission is FREE! 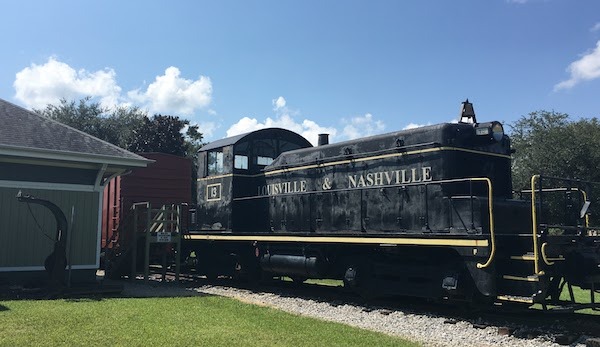 Besides the Foley museum inside the train depot, visitors can explore the full-size train that sits outside. Stairs to the engine platform make it easy to “be” a train engineer. The caboose is preserved and filled with the items a caboose would have held “back in the good ole days,” as well as information about signaling, hoboes and train life. It’s the best caboose display I’ve ever seen (and I have been to a lot of train museums)! 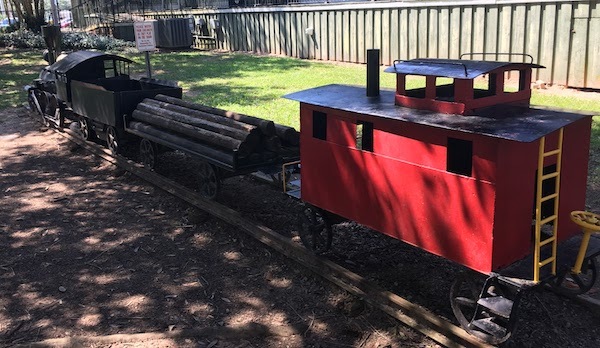 On the other side of the depot, a kid-size train is set up for little ones to explore. The big hit is the Charles J. Ebert, Jr. Memorial Train ride. 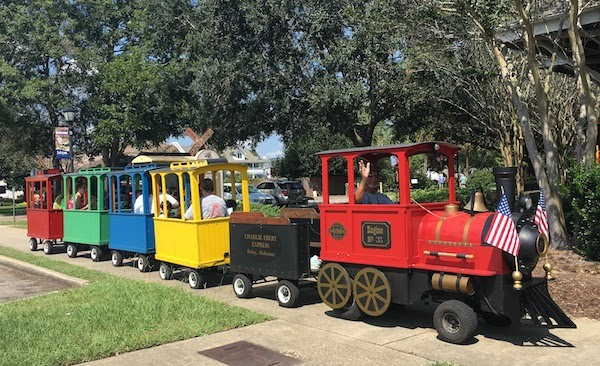 Local volunteers, members of the town’s Caboose Club, take tiny guests and their grown ups on train rides around Foley’s Heritage Park much to the delight of young and old. The ride is FREE and lasts about 22 minutes. It’s first-come, first-served — though the Saturday I was there, no one had to wait more than the few minutes it took for the train to finish its previous route. Train ride hours: Tuesdays, Thursdays and Saturdays from 10 a.m. to 2 p.m. Rides are FREE! After my visit to the train museum, I used the pedestrian bridge over Hwy. 59 to go back to my car. When I stopped to take a photo of the park from my vantage point above it, a man joked that he thought I was there to take his photo… so I did! After a quick laugh, he asked if I had been to the train depot to take a ride yet. I laughed a yes in reply. He said it’s something everyone should do at least once. I agree. The highlight of the Foley train museum is its stellar model train exhibit. Confession time. My dad has a large model train that has taken over much of his garage. It’s always under construction, but quite impressive. He’s always loved model trains, so I’ve seen lots of exhibits through the years. I expected my “travel writer” side to come out: see the train, learn the facts and move along. After all, it was getting close to lunch time and I was hungry. My agenda for the day was pretty long and, as an experienced model train girl, I figured I wouldn’t need to spend much time there. 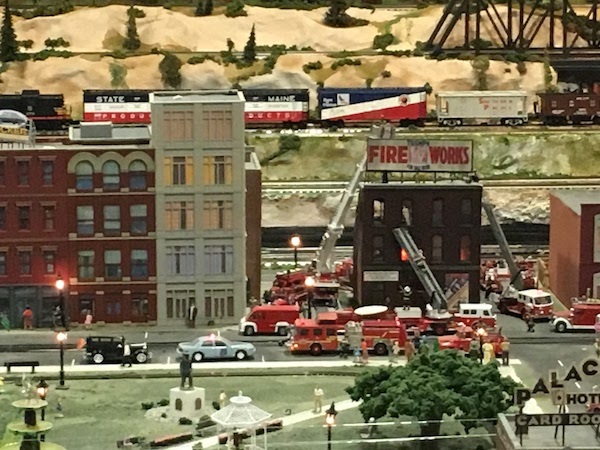 The model railroad exhibit was donated by Alan Goldman of Montgomery, Alabama with the stipulation that there be no charge for admission. Foley’s Caboose Club members went to Montgomery to dissemble the massive layout and bring it back to Foley. The model train is so large, an annex building had to be added to the historic train depot to house it. 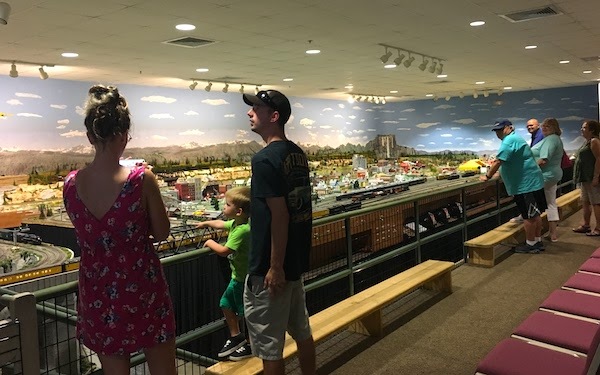 It took volunteers more than 6,000 hours to assemble the model railroad, and it opened to the public in February of 2007. Set in the 1950s, the exhibit is incredible! Caboose Club volunteers enthusiastically answer questions about the exhibit. If you ask any of them their favorite part, they’re likely to say all of it. Understandably. Travel tip: Instead, ask what their favorite part of the construction process was! You’ll get some great answers. 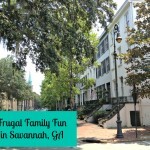 You’ll see a circus, the fire department, a drive-in theater and a cable car! There’s so much more, though. My quick visit turned into almost an hour. I don’t regret a single moment! I even sent video to my dad. My time in that model train exhibit really made me feel like a kid again. My grin stretched ear to ear — and I just couldn’t stop it. By the time I finally got to lunch, my cheeks hurt. No joke! But it wasn’t just me. Everyone who came in, young, old and in between, acted much like me. We pointed out details to each other, took photos and asked endless questions to the Caboose Club. 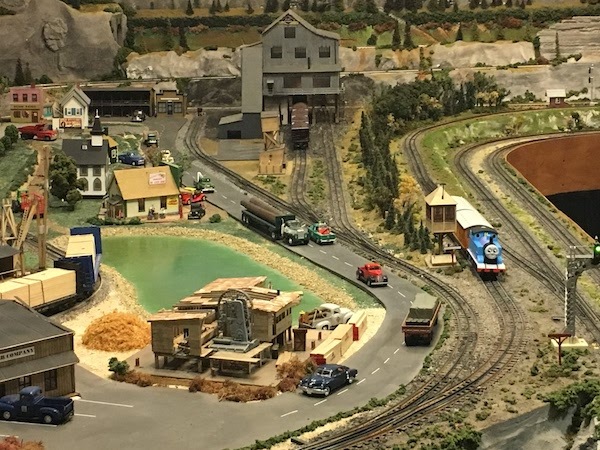 Model train museum hours: Tuesday, Thursday and Saturday from 10 a.m. to 2 p.m. Admission, of course, is FREE! 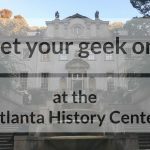 Atlanta History Center: History and the Hunger Games! Pro Football Hall of Fame: Including Kenny Stabler! A very nice article. As Director of the Railroad Museum, I would love to have a copy of this for our archives and the members of the Caboose Club. These guys deserve all the accolades they deserve. I tried printing it from the e-mail that LaDonna Hinesley shared, but was not successful. I would appreciate any help you can give me. You are welcome to copy the link to the post to share with them. Feel free to print a copy as well. Just include the link to the post when you print it out. I’d love it if you’d share the post on your Caboose Club website if you have one. Email me if you need any assistance. Thanks for making me feel like a kid again!